Israel Defense Forces medical missions always fly to disaster zones with tons of medical equipment. For David “Dush” Barashi, the most critical piece of equipment is his red nose. A veteran member of Israel’s Dream Doctors Project, Barashi and fellow medical clowns take the skills they hone daily in Israeli hospitals and apply them at scenes of indescribable despair, death and destruction across the world. Over the past 16 years, in addition to his day job at Hadassah Medical Center in Jerusalem, Barashi has tended patients and/or trained personnel in about 50 hospitals in Ethiopia, Uganda, Kenya, Rwanda, Philippines, Singapore, Vietnam, Thailand, India, Australia, United States, England, Bulgaria and France. “Wherever we go, we work with people feeling scared, vulnerable and in pain." Note he said “people,” not “children.” Though medical clowns do work with kids, many of the 29 Israeli hospitals in which approximately 100 Dream Doctors work also place them on adult units ranging from maternity to surgery. Their job is to provide stress relief and a more positive hospital experience for patients, families and healthcare workers. In no other nation is this paramedical profession as advanced or as integrated in the health system, says Director Tsour Shriqui, whose father, Yaacov, won a presidential volunteerism award last year for founding Dream Doctors in 2002. And as the nonprofit project has grown and matured inside Israel, so it has outside the borders. In 2004, Dream Doctors Barashi and Jerome Arous took their first trip abroad, accompanying a team from Hadassah’s HIV Clinic to an HIV orphanage in Ethiopia. 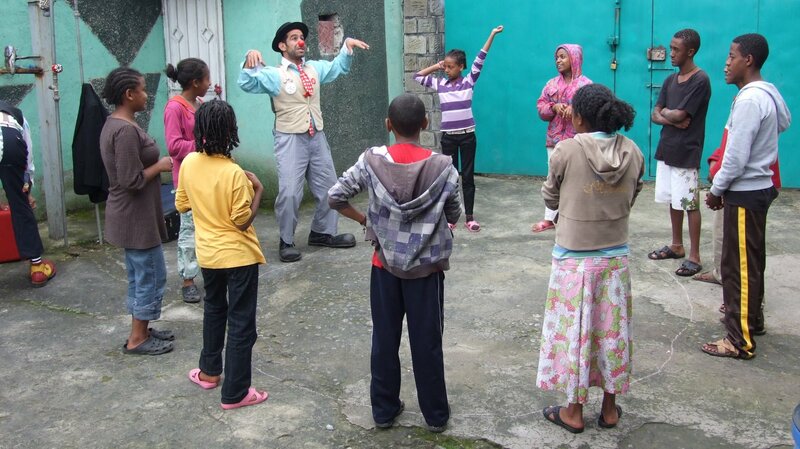 They worked with children directly and trained a medical clowning corps in Addis Ababa. Later that year, following the deadliest tsunami in recorded history, four Dream Doctors flew to Thailand and Indonesia in coordination with the Israeli Embassy in Bangkok. “We created positive activities with post-trauma young adults who’d seen their families and homes disappear,” Barashi tells ISRAEL21c. Dream Doctors’ first humanitarian mission with the IDF was to Haiti in 2010 after a powerful earthquake caused massive injuries. They injected much-needed doses of warmth and comic distraction to wounded children in treatment. Dream Doctors specially trained in intervention skills for disaster zones brought their healing powers to Nepal following the 2015 earthquake, to Houston after Hurricane Irma in 2017 and Pittsburgh after the mass synagogue shooting in 2018. “This is Israel. It’s part of our DNA to be there first to help in a time of crisis,” Shriqui tells ISRAEL21c. Because IDF Medical Corps physicians and Dream Doctors work side by side in their civilian lives in hospitals, they can continue cooperating seamlessly when deployed to crisis areas. Remarkably, the army permits Dream Doctors to fulfill their IDF reserve duty requirement as medical clowns. Since Nepal, every IDF humanitarian mission abroad will include at least two Dream Doctors. Barashi places an Israeli flag patch on his clown costume so that everyone knows his nationality. If he doesn’t know the local language, he communicates just fine in gibberish and adapts quickly to the vibe of the local culture. The Dream Doctors Project does not receive government funding – it depends entirely on donations – but it works closely with Israel’s Foreign Ministry to train medical clowns in developing countries, in partnership with local organizations. In Rwanda, Barashi and Zoya Hayat recently gave medical clowning workshops to the Rwandan Acrobats troupe, did trainings at the University Teaching Hospital of Kigali, and performed at an orphanage. 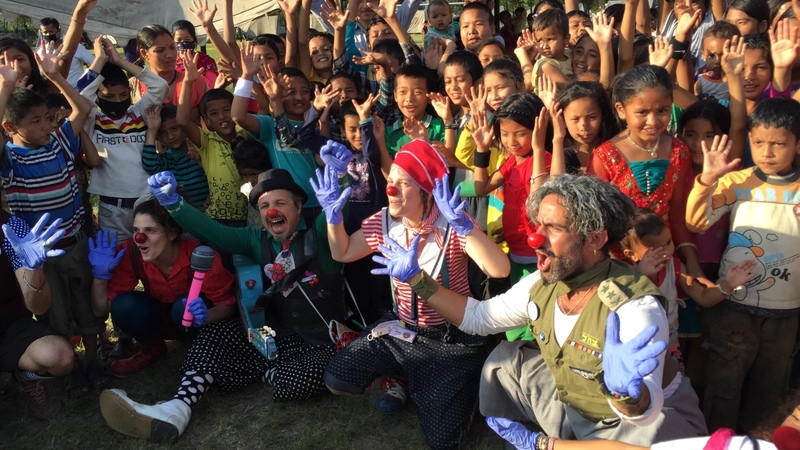 Dream Doctors Roni Vidman and Nimrod Eisenberg entertained refugees from Arab countries in a remote camp in Greece last December, and gave clowning tools to refugees who wanted to learn how to bring a smile to children and adults in their community. Rotem Goldenberg and Noam Inbar led a two-week medical clowning training mission in Macedonia and Albania last year, demonstrating emotional support techniques to use with patients undergoing long-term treatments. In Romania, a Dream Doctor was included in the 50-plus team from the IDF Medical Corps that participated in the Seism 2018 (Earthquake 2018) international exercise in cooperation with the European Union. 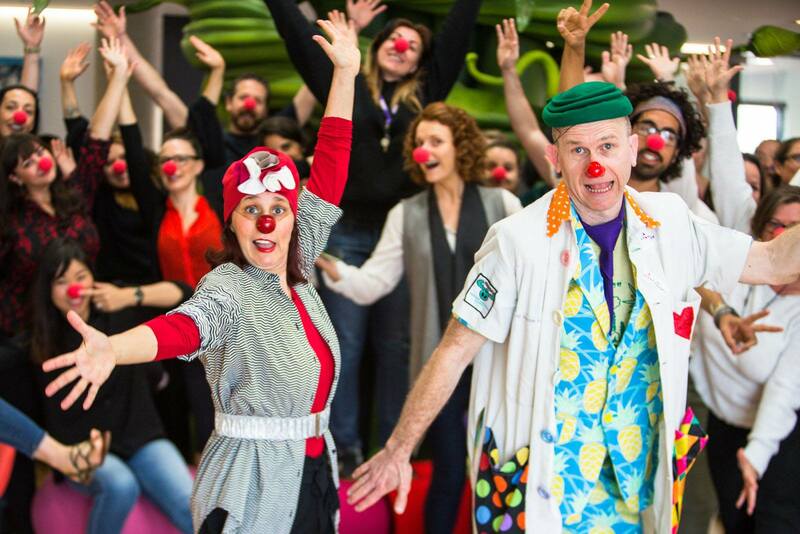 Dream Doctor Shoshi Ofir was invited by the Humour Foundation’s Clown Doctors and the Royal Children’s Hospital, Melbourne, to teach Australian clowns how to work with young victims of physical and sexual violence, and taught doctors how to work with clowns. Ofir also hosted colleagues from Docteur Clown in France at her home hospital, Baruch Padeh (Poriya) in Tiberias, to see her pioneering work in the Tene Center for the Treatment of Sexual Assault Victims. Barashi told of a chronically ill 19-year-old who is frequently hospitalized at Hadassah. After he aged out of the pediatric ward, the clowns successfully advocated for him to remain there in keeping with his wishes. In return – and to make sure he has a reason to get out of bed — they recruited him as a helper. “Whenever a group comes to Hadassah to volunteer with children, he talks to them about how the clowns are a part of his life. We gave him a Dream Doctors t-shirt and huge shoes and a funny hat. And he has a nose that he wears around his neck, but we told him he is not allowed to put it on because he’s not a real medical clown." Hadassah Hospital introduced dream doctors, also known as medical clowns, to Israel. They are empowering patients and staff in a ‘medical revolution with a happy face’.